In 2014, I completed my high school education at Deloraine Collegiate in Deloraine, Manitoba. I started attending Brandon University in the fall of the same year, where I took Pre Nursing courses for my first year. In the following academic year, I switched to studying sciences. I am now in my final year of completing my Bachelor of Science (Honours) degree, with a Biology major and a Chemistry minor. What accomplishments (awards, scholarships, volunteer work, organizations, memberships, etc.) are you most proud of? I am very proud of and thankful for the awards and scholarships I have received for my academic work and community involvement. In high school, I received awards each year and scholarships upon high school graduation. I also received scholarships and bursaries throughout my university studies, including the Dr. N. Demchuk Memorial Scholarship in Biochemistry (Biochemistry I and II with Dr. Charette are my favourite classes!). I was placed on the Dean’s Honour List and inducted into the President’s Honour Society in each year of my Science degree and placed on the Honours List for my Pre Nursing studies. I also held work positions at BU as a residence academic mentor and a laboratory teaching assistant for Basic Mathematics and General Chemistry I and II. In 2017, I started an undergraduate research position in the Department of Biology. I received the Integrative Collaborative Academic Network for Women in Science and Engineering (ICAN-WISE) Scholarship awarded by Natural Sciences and Engineering Research Council of Canada – Chairs for Women in Science and Engineering (NSERC-CWSE). The scholarship facilitates women mentee-mentor academic research. I was mentored by Dr. Ardelli and I was very grateful to be one of the six scholarship recipients. I am fortunate to be a current member of an amazing team of researchers in Dr. Cassone’s and Dr. LeMoine’s labs. Early this year, I was very excited to be a part of a published scientific research (my first published journal article!). In terms of volunteer work, I am most proud of my contributions to our local World University Service of Canada (WUSC) organization. In 2016, I volunteered as a settlement partner of a refugee student through the Student Refugee Program. The program is the first of its kind in Canada to combine resettlement and post-secondary education. For this, I received a service learning recognition from BU and a community service scholarship from Kiwanis International. My heart is very close to my local WUSC family and I will continue to volunteer with them. I also hold other active volunteer positions. I am an academic representative of the BU Pre-Medical Association and the BU Biological Society, the marketing officer for WUSC and the BU Dance Club, a project manager for Enactus Brandon, and a general volunteer for Let’s Talk Science and BU Student Leaders. During my high school years, I volunteered through our Social Justice Club by promoting awareness and raising funds towards local and global social issues. I was born in the Philippines where I spent the first decade of my life. I was raised in an urban area and I grew up experiencing only two seasons (sunny and rainy) where the temperature was almost always +30C. In the summer of 2010, my family moved to Deloraine, Manitoba. Although I was not used to living in a rural area, I have learned to appreciate and enjoy the simplicity, peace, and sense of community that come with rural-living. Despite my almost ten-year stay in Manitoba, I am still not used to the very cold winters! Last summer, my family became Canadian citizens. I am very fortunate to call Canada my home. My family here in Canada consists of my parents, my brother, a husky named Blue, and my many house plants! Growing up in a country with a poor healthcare system, my young self dreamed of treating sick individuals, especially those in communities where medical help was not only unaffordable, but also unavailable and inaccessible. I am taking sciences in university for the primary goal of becoming a doctor one day. The great research opportunities in the biology department have broadened my interest in scientific research. I love the quote “in a world where you can be anything, be kind”. I think it is very simple, yet very meaningful. Everyone is fighting their own battles of which we may not always know. I believe it is important for us to be considerate and to help each other. Being kind is something anyone, anywhere in the world, can be. Plus, it is free to be kind to others! In the near future, I will be starting my master’s degree through the Master of Science in Environmental and Life Sciences (MELS) Program at BU. After that, I am hoping to be admitted to the MD/PhD Program at University of Manitoba. My ultimate dream is to become a physician-scientist to create a positive impact on many human lives through medical and research applications. As co-advisors of Sachi Vilanueva, we are very pleased to nominator her for the International Women’s Day recognition. Sachi is currently finishing her Honours degree in Biology, and throughout her time at BU she has demonstrated excellence in our classrooms, our research lab and in our community. 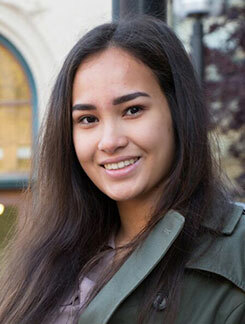 Academically, Sachi has secured top marks in almost every course she has taken at BU, earning her multiple awards and scholarships. Although still a relatively junior student, Sachi has also been involved in primary research for a few years already. In her second year of study, she was awarded the competitive Integrated Collaborative Academic Network for Women in Science and Engineering (ICAN-WISE) Scholarship from NSERC. This award allowed her to spend a whole summer doing research in the lab. This experience was followed by another research experience funded by the BU/BUSU Work study program last summer, and finally by her undergraduate thesis work that she is now wrapping up this term. Through these experiences Sachi has already contributed as a co-author on two manuscripts (one accepted and one in preparation), and certainly several more to come. Beyond research and academic excellence, Sachi has also been a very active member of the community, both on and off campus. She has acted as a residence mentor and a settlement partner as part of the WUSC program, and has been part of multiple clubs and volunteer initiatives (Enactus Brandon, student leader program, Let’s talk science etc.). Sachi is clearly an outstanding BU student and we are therefore very happy to nominate her for this well deserved recognition.